While I have a full set (sizes 1-17) of straight knitting needles both in ten and fourteen inch lengths, I knit almost exclusively with circular needles. I use them for knitting big and small items. I use two circulars when knitting socks and even hats. The baby hats shown in the photo were knit with some of the scrap sock yarn bonanza from the Senior Center. What type of knitting needle do you use the most? Like you, I love circulars. However, I haven't figured out how to use two circs instead of DPNs. It's on my list, though! In the meantime, I am fine with DPNs. I, too, have not figured out how to use 2 circulars instead of DPNs...and I actually like DPNs, so will probably stick with them, but I do use circulars as well for other things. I've never tried circular needles. I learned to knit as a little kid on straight needles and don't remember my grandmother (my teacher) ever using circular ones. I do remember her using 3 short straight needles at a time on mittens. I love the array of baby hats; you make fine hats! Straights, circulars, DPN's...bamboo, plastic, metal...I'll use anything. 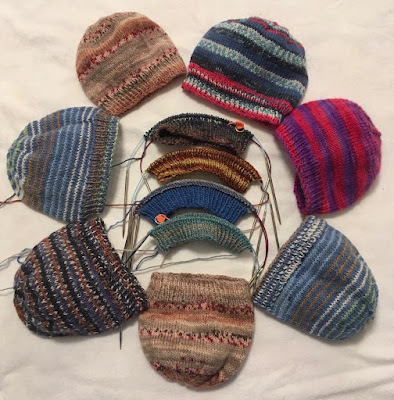 When I first saw that photo, I thought you'd figured out how to do all those hats on a long circular needle! I bet they will be appreciated. I like circs for hats also, but I do switch to dpns for the decreases at the end. I don't knit anymore as it causes me back problems but I do admire others results such as yours. My daughter-in-law from Seattle is visiting at the moment and wanted to learn how to knit. We found a lady in a wool store who was so enthusiastic about circular needles and so that is that we bought and she is so happy with them. Her first effort, a scarf, is coming on great. Beautiful hats! I use all kinds of needles. Dpn’s, magic loop, circulars and I’m using straights right now for dishcloths. Sometimes I use circulars for the dishcloths. Whatever I grab that works! The hats are just adorable! I subscribe to your blog through email, and when I saw the picture, I knew I had to pop in to compliment you here. I always love your projects. They come from the heart - a generous one at that. Merry Christmas, my friend. I haven't used straight needles since the day I tried my first circular one. In fact, I donated all my straight needles. A few years ago, I finally caved and bought a set of interchangeable needles. Before owning them, I thought they were silly. But flash forward a bit and I'm the proud owner of multiple sets of interechangeables and am ready to donate my old circulars. Having said that, I still prefer to knit socks and small tubes with dpns. I like to use circular needles too. I wish I could take private lessons with you so that I could knit both socks at the same time! I love those hats. I haven’t knit in a while, but do love circular needles. There is less risk of having stitches fall off when using circulars. Ok, so I'm almost a year behind :D lol - but if anyone has a tube sock knitting pattern they are willing to share, I'd be very appreciative.